Chevrolet has paid a special attention to its smaller cars at the year’s SEMA, and has come up with a number of finely tuned Sonics and Cruzes. Two of the them best are these Z-Spec Sonics here. Most of the show cars wear conceptual Z-Spec styling enhancements, which are being evaluated for production. 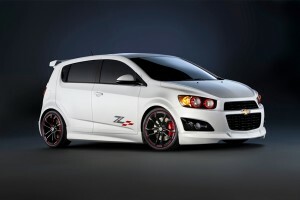 Z-Spec is a line of performance, styling, and personalization accessories available at Chevy dealerships. 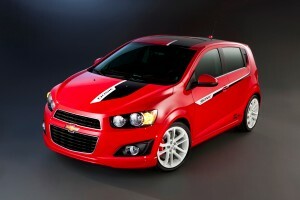 Sonic Z-Spec #1 – Designers took a turbocharged Sonic five-door and dressed it with concept Z-Spec accessories. They added Z-Spec ground effects, a spoiler, unique grille and graphics package – then finished it off with a Torch Red exterior and Z-Spec concept 18-inch wheels. Inside, the Cobalt Red cabin features custom trim, including perforated black suede seat inserts, a Z-Spec sport pedal kit, sport shift knob and a racing-style flat-bottom steering wheel. Additional upgrades include performance brakes with four-piston calipers, a new high-flow exhaust system and performance suspension parts. Sonic Z-Spec #2 – The next Sonic concept – in Flat White with Torch Red accents – builds on concept Z-Spec accessories with a more aggressive ground effects package, unique grille, rear spoiler and graphics package. It rides on Z-Spec concept 18-inch wheels and also includes a re-trimmed interior with Z-Spec sport pedal kit, Z-Spec sport shift knob and a flat-bottom steering wheel. It also features custom racing seats with the Z-Spec logo. The factory powertrain features the 1.4L turbo engine and six-speed manual transmission. Performance upgrades include brakes with four-piston calipers, a high-flow exhaust system and suspension parts.